Danish Army Specific: Around 1977, the Danish Army issued a Request for Proposal together with specifications for a MC to replace the fleet of old BSA and Nimbus MC´s. Besides Yamaha´s DT250MX, Honda XL250, Husqvarna Military and Maico M 250/M were tested in 1978. 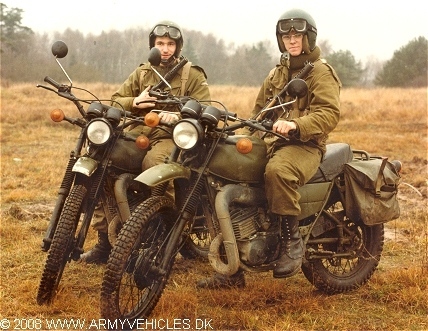 In 1980 the Army decided to buy the Yamaha MC, and some 450 units were delivered through Franz Kroon Motorcykler I/S in Aarhus. The acquisition price was around 14.000,- DKr. each. The MC´s were delivered to end users between June and August 1980. The Yamaha only lasted a few years and was superseded by the BMW R65GS. Historical: Militarised civilian machine. The content of the fuel tank was increased by 50 %. Length: 2.15 m (84 inches). Width: 0.88 m (34 inches). Height: 1.14 m (44 inches). Weight: 295 kg (649 lb.). Engine: Own 1-cylinder, 246 cm3 (15 cubic inches) displacement, air cooled. Horsepower: 23 at 6.000 rpm. Brakes: Drums front and rear. Tyres front/rear: 3.00 - 21/4.00 - 18. Fuel capacity: 12 liter (2.6 gallons). Range: Approx. 130 km (80 miles).